Featuring a pair of especially talented netminders that roamed NHL creases throughout the 1990s, we have a trio of game-used sticks, with a pair that saw action with Ken Wregget, along with an example used by Tom Barrasso. The Barrasso stick is a mid-1990s Sher-Wood PMP 530 model with “Barrasso 35” factory graphics, with the original black tape over the blade and white over the knob with handwritten “35”. Just light use is exhibited, with wear to the blade including some red paint transfer, with additional blue paint transfer over the shaft. The Wregget sticks are both Cooper Superpro models with the original black tape over the blades and white tape over the handles and knobs. 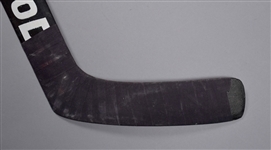 One stick has “Wregget” stamped-on, with this example most likely seeing use with the Penguins (circa 1993-95), with wear to the underside of the blade along with marks to the paddle. Wregget has added a black marker signature to the paddle, and it displays well. The second example is most likely from circa 1991-92 (Flyers) and has a darkened handle, with a few rips to the blade tape and a few loose strands, with the paddle broken completely at the handle, rectified with glue. A piece of tape has also been added to the lower paddle, with handwritten “Ken Wregget – 3/28/92”.